From my rear view mirror. I took this photo as proof (to myself) that I actually made it out of the house with THREE children (Adelaide is there--she's the bundle on the left)--that they're all dressed, appear to be reasonably happy, perhaps fed, and I even appear to have showered. This is all due to the amazing powers of my new friend. Coffee. I've never been a coffee drinker, but last Friday (which really should be spelled FRYday, cause I feel so freakin' fried by that point in the week), I thought I'd give it a shot to help give me the extra boost I needed to get through the day. And it totally worked. Worked like crazy. By 10 am, I had everyone dressed and fed, the house was clean, and I was all caught up on laundry. Not to mention the craft project we had already completed (and cleaned up after! ), and the rousing game of pirates we had played. Oh yeah, and lots of nursing and burping and diaper changing too. Amazing. Coffee. Who knew? So that's my new plan. Coffee on Fridays. I figure if I just do it one day a week, it can't be that terrible for my body (or Adelaide's belly), and it will still have that super strong effect on me. Whopee! I must say though, that the coffee did little to help with my sudden and complete loss of my short term memory (which comes with the territory of newborn babies...but god, they're cute). Case in point: At the end destination of the above-photographed car ride, I took the kids out to lunch (that part went surprisingly well--musta been the coffee still in me). As we left the bakery, I put the keys on the top of the van so that I wouldn't lose them in the process of loading up the kids. Loaded everyone up, got the bags in the car, etc....and then promptly forgot where the keys were. 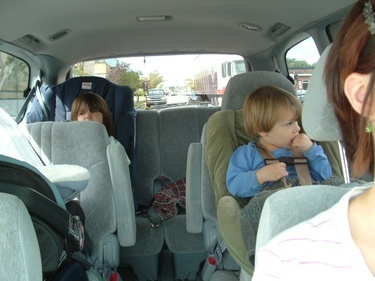 I searched and searched the van (amazing how much crap you can pile in a minivan! it's great until you're looking for something as small as KEYS! ), the sidewalk, the street, and then the van again..... Yup, this went on for half an hour (at which point Adelaide was screaming and needed to nurse, Calvin was telling me he needed to poop, and Ezra was crying about wanting his "purple thing"--huh? "What purple thing?") until I finally unloaded the kids and went back into the bakery to look for the missing keys, which weren't inside either, of course. Upon arriving back at the van, I spotted the keys. On top of the car. Right where I had left them so that I wouldn't lose them. Self Portrait bloggers found here.